Wine Geek Greg Bellow has organized (if you call this group "organized") another blind-tasting of bottles from private cellars. This evening's theme was Pinot Noirs, all but one of the wines coming from the Russian River Valley in Sonoma County. The wines are from a range of vintages, the oldest being 1990, while the youngest wines are from 1997. 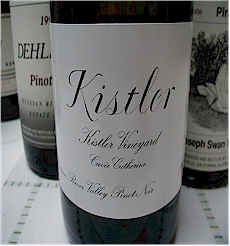 1997 Russian River Valley "Kistler Vineyard"
"Smells like fish!" said one taster. Another felt it was corked, though the majority of participants disagreed, finding "volatile, sharp notes" on the nose. "Lots of ethyl acetate." said one. Another described it simply as "Spoiled." One person found a "...bit of fruit, herbs, alum with a sour and drying character on the palate." My notes have this as "Older tones to the bouquet, with some resinous, piney notes. It becomes more sharp and volatile with aeration. Past its prime." "Dried cherry, forest floor, herb notes with dark, candied cherry notes and some cedary oak. It's good, but not as good as others." proclaimed the first critic. Another person felt the fruit was "over ripe." Someone else was curious to know if this was "cold soaked" prior to fermentation as they found it excessively bitter and astringent. Someone else wondered if Sinskey added back some stems to achieve this level of "attack." I found light cherry fruit with a vaguely herbal note and a touch of earthiness to the fragrance. It is fairly astringent, having more tannin that it needs. It may soften in 5-10 years, but what will the fruit be like at that point? Many tasters blasted this wine for its aroma, finding "vegetal, bell-peppery aromas and a stemmy character." Another found a "sulfuric, dirty and dusty character backed by a mildly plummy fruit note." Someone else felt "this had a real problem, being stinky, metallic and with a sour grass note." Another person wondered if this has some Brettanomyces. Some described it as having a fragrance of "dirty diapers." One person was more positive, saying "the fruit in the mouth was good." I found hints of a "root-like" character with beet-root, light oak and a hint of a paste-like fragrance. It reminded me of some of the wines of Alain Hudelot-Noellat, rarely tasting competition winners, but satisfying to those of us who appreciate good, old-fashioned Burgundy. "This displayed an aroma of sweat socks at first." said one critic. Another disagreed, finding "vanilla and oak, but it suffered on the palate compared to its lovely nose." One other person felt it "fell off fast." Another critic nailed it for being "sour...dusty and sour cherry notes to the nose but sour and very drying on the finish." Someone said it was "out of balance." Another felt it was "too light and non-descript, being almost like a Beaujolais." I found it to have light cherry fruit notes but with a metallic or iron note backing it up. Mildly tannic and with a good core of fruit, having nice cherry-like flavors. Though I ranked it 7th, I felt it was a one star wine. "Toasty, yeasty notes and a lot of oak." said the first person to offer and opinion on this wine. "Nice texture with increasing complexity and wonderful fruit flavors." asserted someone else. Another felt it was too high in alcohol, but someone else said it had a "voluptuous texture." One person said it's "not as complex as the other, but it has an underlying promise." Another described the Rochioli as having "plenty of stuffing." I found cherries and candied cherry notes along with a mild mocha tone to the fragrance. Nice, silky texture on the palate caused me to finally test it for sugar to see if the richness was from extract or residual sweetness. The wine is, happily, dry. Lots of sweet cherries on the palate. One star. "Rich, herbal, complex aromas with good depth." said one defender. "Cherry cola." 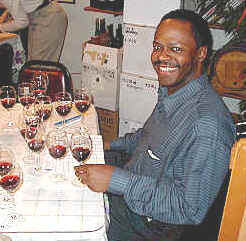 was the way another described the character of Swan's '96 Pinot. Another gentleman tabbed it as "Tutti Frutti" and found fault with that. Someone else said "I loved it for that character." "Lots of ripened black fruits with a vanillin finish...herbal notes and some minerality." said another fellow. I found some cherry fruit, a touch of herbal fragrances and a root-like note with some anise or licorice scents. Good structure, with mild tannins and the same flavors as promised on the nose. "Zinfandel and over-ripe." were the criticisms of the first pundit. "Yes, but it's fabulous Zinfandel." said a second. "Too hot." criticized a third. "It's soft and flabby and losing its structure." said another, though someone else took issue with that assertion. One other person found an off note to the nose. I found sweet cherry fruit and very good, typical Pinot fragrances. Nice oak, too. Mild tannins, nice cherry fruit on the palate and a light bit of oak. "Big, oaky and powerful." said the first critic. A couple of others were less-than-enthusiastic, one saying it's "bizarre," while another said it's "uncharacteristic of Pinot Noir." Someone else said "Perhaps it is those, but it's the best wine of the tasting...plums, wild berries, sweet fruits, black raspberries..." Another described this as having notes of "oak char." Someone else pegged this as having the "best nose...cinnamon fragrances." Another taster questioned whether the wine was well-received because it was the youngest and boldest wine. One critic felt the aromas were superior to the character on the palate and suggested this should be consumed now, in its youth. I liked the flowery and exceptionally fruity notes. There were hints of sweet spices and a touch of that high-toned fruit reminiscent of bubble gum. The flavors are deep and complex, suggesting anise, cinnamon and nutmeg. It seems to have a shade of heat, but it's pretty and showy. Two stars. 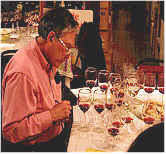 Wine-Taster Extraordinaire Singleton Bender looks for nuances of Pinot Noir in this tasting.